On a pipeline, the job isn’t finished until the land is restored to its natural state. Relocation is achieved with minimal mix of clays and topsoils. The soil is put back evenly with minimal compaction. The Power Dozer provides a better way of moving earth. It’s faster and more efficient than any conventional machine on the market. As a backfiller or a side-caster for stripping and relocating topsoil, the Power Dozer is the most efficient method available. 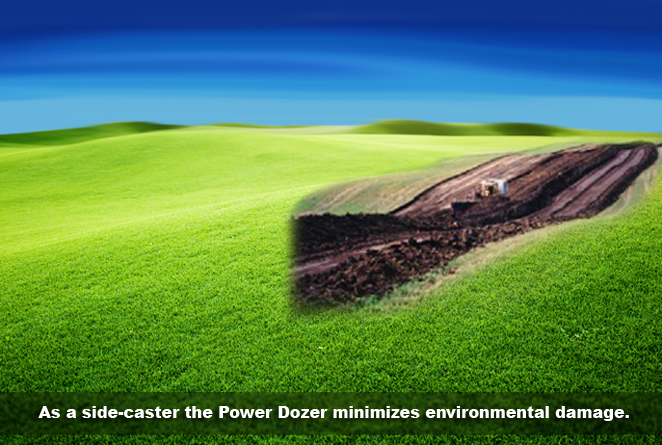 As a side-caster, the Power Dozer minimizes environmental damage. When stripping topsoil, quality of separation is unequaled and accomplished with good integration of organic material, without pulverization. As a backfiller, the Power Dozer ensures a controlled flow of material, the fine particles tend to flow ahead, under and around both sides of the pipe. Larger chunks of material have a tendency to spread to the far side of the ditch where they will not damage the pipeline coating. LEARN MORE ABOUT BACKFILLING.